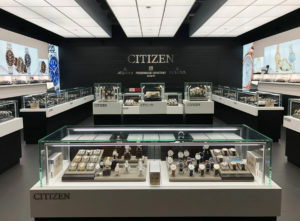 The Dolphin Mall of Miami, Florida welcomes Citizen Watch. The 1,598 square foot space which opens October 6, 2018, features dark oak plank walls, 360-degree glass showcases and, opulent luminous lighting. Kenneth Park Architects acted as the main design firm for the retail space. Design credit is to in-house architects Christine Fiorella and Kate Kim. Kenneth Park Architects is a full – service architecture firm with offices in New York and Los Angeles. Kenneth Park Architects specialize in retail, commercial and mixed-use architecture for developers and retailers; and provides services on a national, and occasionally, an international level.